Leaving Cadiz, Spain, we faced a day at sea. I was ready for a break from an up to now port intensive cruise. A little reading, a little writing, a little eating--make that a lot of eating. It was an interesting day since it was also Halloween. By the time evening came, there were quite a few unusual and clever costumes. 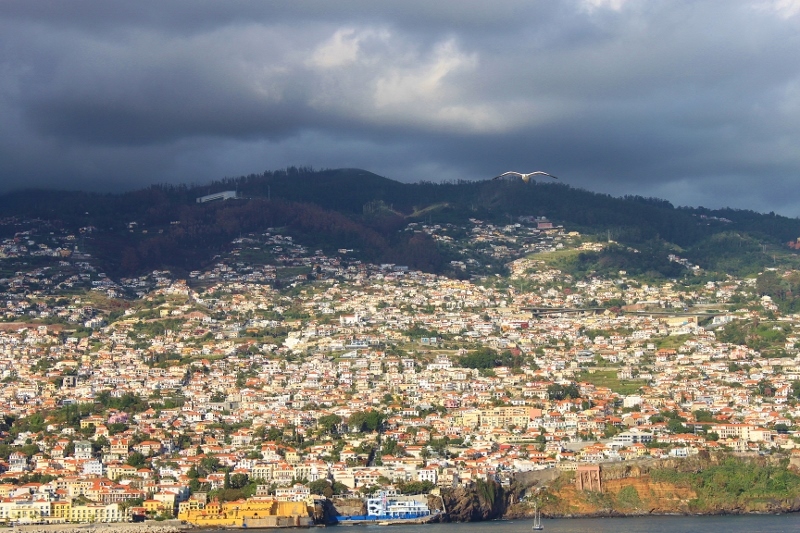 After our day of rest at sea, we were ready to face a new adventure in Funchal, Madeira, which is a part of Portugal even though it is an island that sets out in the Atlantic. 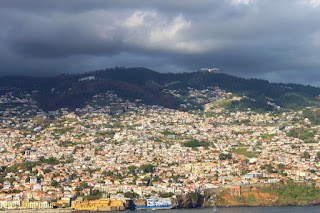 All I could remember from our previous visit to Funchal was hazy since I’d been ill that day and filled with decongestant and/or antihistamines. As luck would have it, there was another HOHO bus. We didn’t hesitate. Unfortunately, while they sold tickets for the HOHO bus on the dock, we had a good fifteen minute walk in the sun that was warming up quickly to where the first bus stop was. Once aboard, we delighted in one of the best HOHO rides we’d had. For one thing, the ear buds worked well and the narrator was easy to hear and understand as well as having some nice local music playing in between the narrations. The plan had been to take the bus around and then come back to the point near where we started to catch a ride on the gondola to the village of Monte 1800 feet above us. The top of the mountain didn’t look inviting however with dark clouds shrouding it. Optimistic, we thought by the time we were done with our ride perhaps the dark clouds would move on. 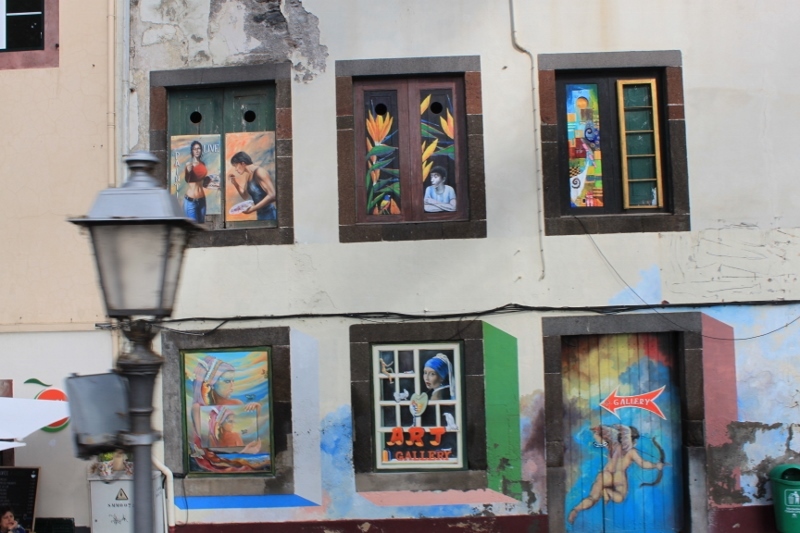 Our tour took us on a long loop around Funchal and to some very picturesque places. 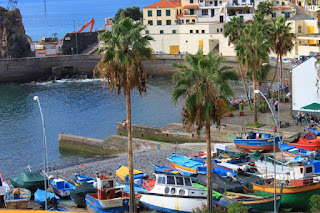 One spot, Camara de Lobos, was where our narrator said Churchill came to paint. Some of the vistas reminded me of a painting we bought on a cruise, not because we knew where it came from but because we just liked it and it was the right size for over our mantel. Now I was beginning to wonder if perhaps the artist had painted one of these views. A fleet of colorful fishing boats were all pulled into the shore. This day was All Saints Day and as such was a holiday here. That probably explained a lot of the locals we saw gathered in groups either around a small table or just a ledge of a walkway playing a card game—probably with a little side wager, I’m sure. 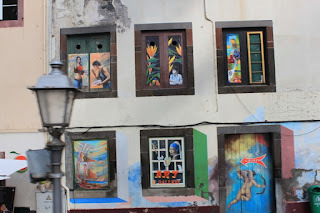 There were lots of hotels and resorts in Funchal. It must be a popular place with Europeans for their warm holidays on the beach. 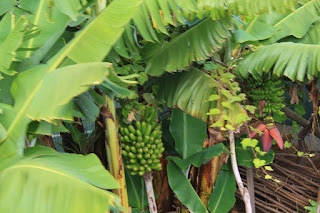 Far outnumbering the resort areas however were the acres and acres of banana trees. They stretched up and down the terraced hillsides. 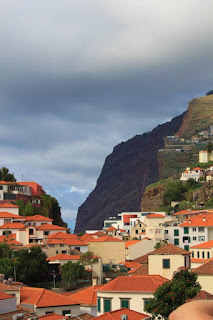 We actually saw only one small place where there was a grapevine so apparently the grapes grown for their famous Madeira wines must be on the other side of the island. The bananas were said to be their second largest export going mostly to European markets. One of the things that caught my eye were the beautiful orange tulip trees. 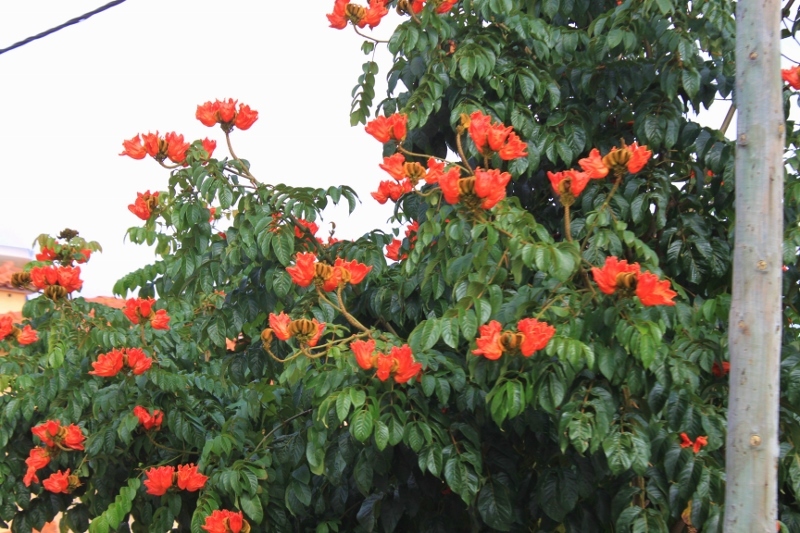 I think they may be call African tulip trees. I seem to remember that from some other trip. We passed a wall full of painted “graffiti” that was a collection of art resembling some famous works. 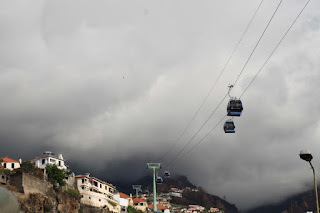 When we got back to our starting point, we decided to forego the trip in the gondola. The bus ride had taken us to such beautiful vistas that we couldn’t imagine it being any better from Monte. Besides, it looked like it was still raining up there. We headed back to the ship. That afternoon as we pulled out of our last port to head across the Atlantic to Fort Lauderdale, I watched the pilot from the port get picked up from our ship. 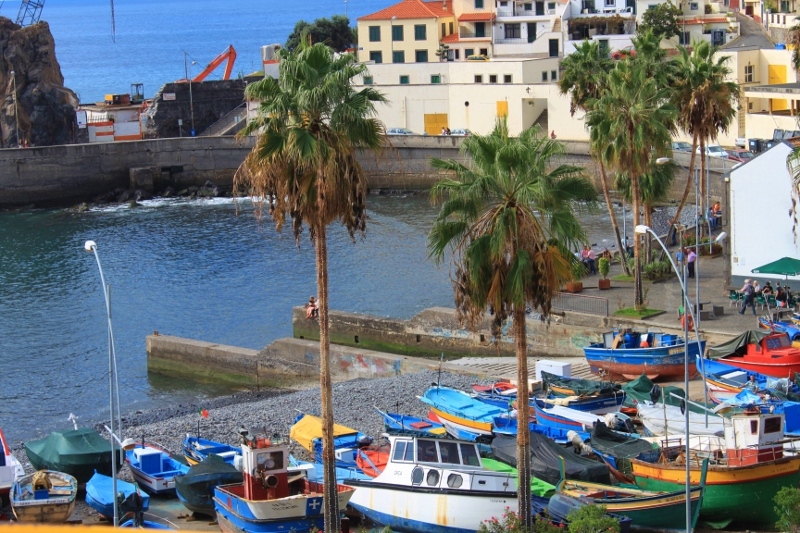 Each port requires a ship to have a local pilot on board as they enter and leave the port. It’s for legal and safety reasons. A local pilot will know the quirks of the currents and the lay of the land below the water level and stays on the bridge with the captain until the ship is out of the harbor. It always amazes me though how they manage to jump onto the pilot boat and never miss. At least I’ve never heard of one of them missing. This pilot made it safely as well and waved to the many watchers on the decks of our ship. As we sailed farther away from Madeira I marveled at the homes and buildings lining the hills and mountains and cliffs. It is amazing to think about how some of them could possibly have been built before there were modern cranes and building materials. Seven days at sea lay ahead. Hopefully they would be calm and uneventful weather-wise.